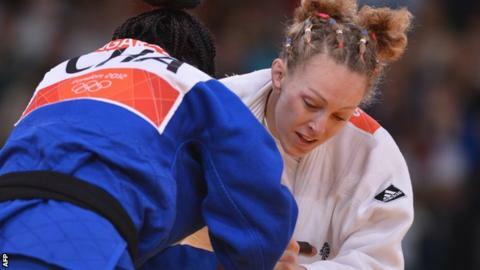 Scottish judoka Sally Conway hopes success at the European Championships - which begin on Thursday - will boost her Commonwealth Games medal prospects. Conway, 27, lost in the second round at the London Olympics, but Grand Prix success this year has seen her rise to third in the European -70kg standings. A medal in Montpellier, France, would boost her ranking further. "It's a busy year, with a lot of big events, but I have a massive goal is to be Commonwealth champion," she said. "If I can win a [European] medal it will help my ranking heading into Glasgow, which can give you a better draw in the early rounds." Glasgow 2014 will be only the third Commonwealth Games to feature judo, with Manchester 2002 the last time it was included in the programme. "Success (in Montpellier) would be a massive confidence boost and keep the momentum going into the Commonwealths," said Conway. "It's going to be a massive opportunity to promote the sport and where I think there'll be amazing support." Olympic silver medallist Gemma Gibbons misses the Europeans due to injury, while London 2012 bronze medallists Katrina Bryant retired last year. Conway is joined in the six-strong British squad for the Montpellier Euros by English medal prospects Colin Oates (-66kg) and Ashley McKenzie (-60kg). Oates, 30, won European open gold in Glasgow last year, but could not compete at the main European Championships due to injury. "Missing last year was a disappointment and I want to try to make an amends and go better than bronze," said the judoka, who finished third in 2011. "I've had some sticky events recently, but Turkey (where he won bronze) was a decent performance and it reaffirmed my belief I can win the medals." McKensie, 24, who claimed the final podium position at last year's Euros is keen to build on that result as he continues his build-up to the Rio Olympics. "The Euros are a stepping stone towards becoming the greatest," he said. "If everything goes right on the day, then I can definitely get a medal, if not win it." Men: Ashley McKenzie (-60kg), Colin Oates and Nathon Burns (-66kg) in action on Thursday. Women: Sally Conway and Megan Fletcher (-70kg) will fight on Friday; Natalie Powell (-78kg) will compete on Saturday.